A few months ago many of us lined up somewhere to receive our annual dosage of sore arm and flu symptoms, er, I mean, our flu shot. But, not everyone gets the flu right? Only those exposed, without having a strong enough immunity, will catch the disease. So why not just get a flu shot when flu symptoms start becoming noticeable? Don’t be silly! By that time it’s too late! So what does this have to do with social justice infecting a Southern Baptist seminary (to pick from the countless examples one could draw from the hat)? Only those who fear getting a disease will line up for the immunization, which is what the video was. A warning for those who see the threat social justice poses. It was not open heart surgery, nor antibiotics for someone already infected. To them it was only a concert for the deaf. Now, this gets down to the base assumption. Social justice is deadly, it kills, and a truly orthodox faith cannot ultimately survive being tossed about in its waves. The vast majority of responses to the video indicated A. This same belief, or B. A process of coming to this belief. I should probably say two things at this point. First, I have been greatly encouraged by the large and diverse group of people who have shown their support, including alumni, prospective students, current students, and even at least one person on staff. Second, because of the variety of platforms in which comments and personal messages have been sent, and because of my own tight schedule, I will not be able to get to all of them, but they are appreciated. Now back to needles and scalpels. Social justice does need to be rooted out. And yes, I have endeavored to do my part not just in exposing it, but explaining it. The video was perhaps high on the exposing, and low on the explaining. This is not a defect anymore than an immunization is not heart surgery. This being said, I will now grab my scalpel for a few minor incisions. There were a handful of negative remarks that I thought I would do well to address. One person accused me of saying that SEBTS had to dumb down their academic standards in order to receive minorities into their program. Of course, I said nothing of the kind. Changing the curriculum by making it less academic and more devotional (I.e. dropping hermeneutics as an M.Div. Requirement, and adding in courses on leadership and Christian disciplines, not to mention social justice courses sponsored by the Kern Family Foundation), is what is causing the lower standards. There is, however, a point to be made here. A personal friend of mine has been a member of the Southeastern society for years. At a donors meeting last year he told me about the pitch that was made to sponsors. Long story short, Southern Baptists are afraid their denomination is going the way of the woolly mammoth. One way to combat this, is to diversify the campus, at least according to them. Affirmative action and social justice are the chosen strategies for attracting this audience. Here’s where the scalpel cuts. Minorities are capable. The immediate objection is usually that systematic racism determined that they would start a wrung down on the economic ladder. The giveaway here is that affirmative action sees ethnic and gender categories before it ever sees economic ones. It isn’t because of poverty that wealth is re-distributed, it’s because of something more fundamental. As a woman, or as a minority, you are not capable. You need our help. But that contradicts the second sentence of this paragraph? That’s because the second sentence is what I believe, and the fifth sentence is what proponents of affirmative-action believe when it gets down to it. With “Kingdom Diversity” also comes social justice in advocacy and implementation. Though I tend to be more convinced that the advocacy of social justice has more to do with alleviating a white guilt that the cross of Jesus Christ must have overlooked, it is crystal clear that its implementation, in the minds of its creators, was for the purpose of attracting minorities. Let’s think through this. Requiring knowledge of the Bible, including hermeneutics, is not enough to attract minorities? There needs to be something extra? What they really understand is social justice, so let’s focus on that. The problem with all this is, well, it’s, um, a bit racist. This is not being all things to all men, unless of course the apostle Paul thought it was unnecessarily offensive to share the gospel with some unless it was served with a little bit of left-wing politics on the side. No, the assumption here is that minorities will not come for just the Bible. I say this is a wrong assumption. All who are God’s sheep hear his voice, regardless of skin color. If someone was willing to adopt the ideas contained in the previous three paragraphs, there would be no contradiction in also adopting the idea that academic standards need to be dumbed down for minority students. But, I'm the one rejecting all these ideas. Another objection, which I saw more than once, was that I should name names. Now I do realize, there are those who may have received more of an inoculation than they really needed. I fear that for some, not only has this destroyed the social justice disease, but it has also destroyed kindness and graciousness with it. I’m not really in the business of sniffing out communists or racists simply to sniff them out. I find it interesting that the majority of times in the epistles when heretics are called out they are not named. Words like antichrists, false teachers, false prophets, and wolves seem to do. Because I’m warning about a disease at an institution, and not a particular person, I feel the same way. There is also the other side. Those who think I should name names so that I cannot hide behind anonymity. I think what this crowd fails to recognize is that my warning is for those considering an institution. Some of the players involved are people, not organizations, events, or articles. But the same case can be built upon the latter three. They are the proof in the pudding. If there were a small number of people pursuing a hostile take over I would name them. This isn’t a take over though. This is a united front. Those to whom I made the video, who are already against social justice, are free to look at the front and see if what I say about individual players rings true. Otherwise, I don’t have personal problems with anyone, and as I stated in the video, I’m not looking to start any. My focus is broader than individuals. A note on heretics- those pushing social justice occupy a broad range of dogmatism. Not all of them are heretics. In fact, the majority are probably not, at least yet. As I emphasize in the video, SEBTS is in a transitional phase. They only recently welcomed a female to their board (The board that oversees a seminary curriculum for men in the ministry), as far as I know the MLK 50 was the only sanctioned event given for class credit that outwardly pushed an identity politics message, and I did not hear about a professor warning students in his theology class concerning reading the Bible through the lens of “white privilege,” until last year (to name a few things I did not mention in the video). If left unchecked, all Christian organizations that have adopted oppressor/oppressed categories will eventually land themselves in heresy land whether they like it or not. A Gospel that places only certain “oppressor” groups upon the everlasting hamster wheel of penance is ripe for Tetzels, not Luthers. A final clarification. There are probably a few out there who, after reading this, are seething (a good indication that one has already caught the disease). How can he be so arrogant as to think he has the cure?! I will answer this- I don’t. Why Peter, an apostle was temporarily taken in by Judaizers I don’t know. Paul was not superior to him in spiritual discipline or love for the Lord. But Peter repented. This is the surest sign that someone is in fact a believer. Continuing in willful error is the sign of a false teacher. I’m certainly no Paul. I’ve sought to use some of his strategies (including his sarcasm at times), but like him, I am the chief of sinners. Let me tell you about Jesus. May I? I would have no light if it were not for Him. Without his Word I would be blind to the errors of social justice. It is the New Testament which tells slaves to serve even their unreasonable masters with the love of Christ, says it is the worker who is worthy of his wages, and endorses private property (Peter to Ananias) and even unequal wages (parable of the Vineyard) that I bend the knee. Men are the “heads” of women (complimentarianism), masters in charge of slaves, and parents in charge of children. Racial categories are not even consideration, at least not in the sense social justice advocates want them to be. Here’s where we are all equal- we are all equally sinful and responsible for breaking God’s law, a fact that does not distinguish between gender and ethnic groups. Here’s where Jesus comes in. You want to talk about giving up privilege? Jesus gave up everything to die for yes, even slave owners, and yes, even slaves. He took the wrath of almighty God for His own. It is at this point that two groups emerge within Christian churches. Sheep and goats. The sheep hear His voice, the goats reject it. The outward trappings of self righteousness are just too tempting a prospect to part with. I’d rather let Jesus deal with my sin, and the sins of my ancestors. Just because my eyes are open to social justice does not mean they are blind to other areas of works righteousness. 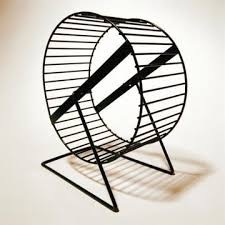 May the Lord Jesus take away all our hamster wheels and immunize us against finding new ones. May He take off the heavy load and replace it with an easy yolk. He alone is wonderful and He alone is who we must preach. Excellent, excellent work you're doing here. Keep up the good work.